Offering an interesting insight into cutting-edge contemporary cancer management, this book is timely, given the focus on personalised medicine and the increasing number of targeted anti-cancer agents in development and clinical practice. 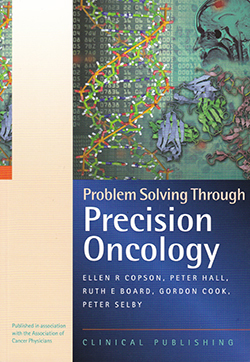 It comprises a number of short chapters covering some of the most recent developments in precision oncology, followed by a series of case studies. A reasonable knowledge of genetics and genomics is required to navigate some of the science-heavy content. In some ways, the book raises more questions than it answers regarding personalised medicine. The authors acknowledge that the field is rapidly changing and that some of the developments are unlikely to make it into standard clinical practice, certainly in the short term. That said, this book will appeal to experienced nurses working in cancer genetics, clinical trials, undertaking further study in cancer nursing or whose role requires them to discuss targeted therapies with patients.